The limits of precision casting were explored experimentally at the Bronze Casting Workshop at Wilhelminaoord, the Netherlands, by making wax models, moulds and lost wax castings using essentially early metalworking conditions. Geometrically patterned models of Dark Age type dies were used to make wax patterns to simulate one of the finest detailed objects to come from excavation, the Tjitsma die. 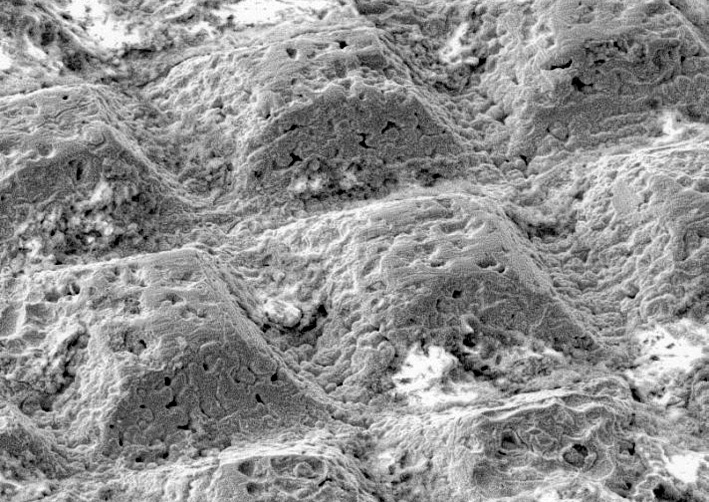 Examination of mould surfaces and castings by scanning electron microscopy showed that the limiting surface resolution of lost wax casting in bronze was the finely textured dendritic cast surface. The mould surfaces had taken the geometric pattern of the original wax models very well, although there is a fine particulate texture to the mould surface, but this is far finer than the limiting dendritic surfaces of the cast bronze. In the light of these experimental castings, which show the limits of our casting techniques, the Tjitsmam die is a remarkable casting of the highest quality. Casting molten metal and the associated refractory technologies are arguably the most important and certainly the most fundamental of metallurgical processes, being the precursors to all metal working, except for the cold working of native metal. When considering precision casting, the question that is of most interest is what is the ultimate surface resolution that can be obtained by cast metal taken from a detailed design in the walls of a mould? Are there particular limitations caused by, for example, the effects of surface tension of the molten metal against the surface of the refractory mould, which might prevent sharp corners and details from being reproduced. The fact that molten metal does not wet the surface of a refractory must be a constraint for metal not to fill all the details of a mould. The effects of shrinkage and dendrite size will also play a part in the ultimate definition achievable. An inseparable problem comes before casting - how fine is the detail left in the surface of a mould from a lost wax investment? Some of these questions were addressed at the Bronze Casting Workshop at Wilhelminaoord, the Netherlands, by experimental mould making and lost wax casting using essentially early metalworking conditions. A second set of experiments was later carried out under more controlled workshop conditions by Anders Söderberg in Sweden. 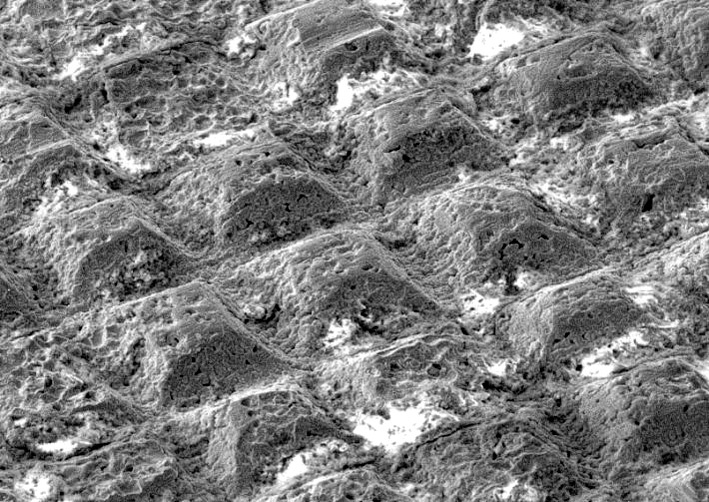 Examination of the castings and moulds by optical and scanning electron microscopy (SEM) reveals the surface detail of these materials for comparison with original models. The Merovingian Tjitsma die as a model for casting. To study experimental precision casting required a suitable finely detailed archaeological object to act as an example for lost wax casting. A complex cast Merovingian die with a geometrical 'boxed' pattern from recent excavation at Tjitsma has been previously studied (Tulp and Meeks 2000, Bos & Nijboer 1996). This die was cast with a positive (raised) pattern (See Figure 1) and overall the very fine die pattern is of similar dimensions to the 'boxed' pattern of gold foils from the Sutton Hoo garnet jewellery (Meeks and Holmes 1985). Negative dies of similar pattern were used to punch the gold foils that were routinely placed behind polished garnets set in cloisons in Anglo-Saxon and Merovingian, Dark Age, jewellery (Bruce-Mitford 1978, East 1985, Arrhenius 1985, Avent 1975, Avent and Leigh 1977) (See Figure 2). Five other dies with simple cross-hatch patterns are also known from Denmark (Tulp and Meeks 2000). The Tjitsma die is a very fine casting made in antiquity, and therefore reproducing model dies of this type by experimental casting would test the limits of precision casting. While direct modeling of the Tjitsma die by impressing it into wax was attempted, the die surface is partly corroded and this would have added texture to a casting. 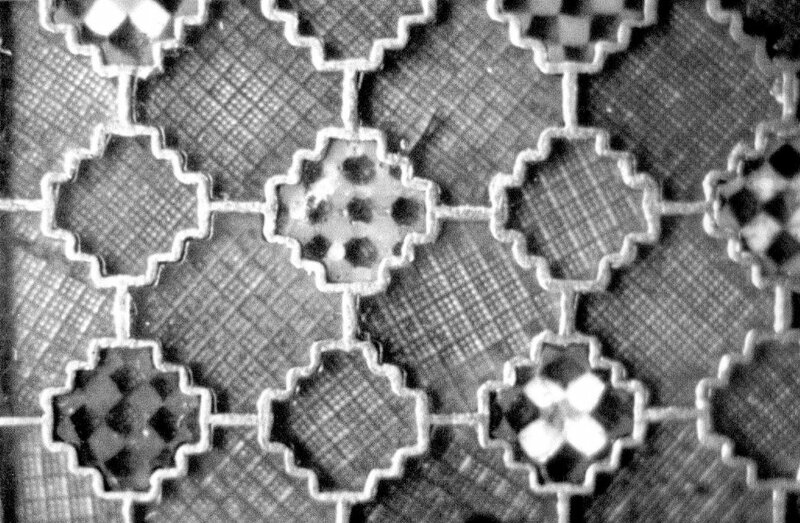 Alternative cross-hatch pattern model dies were available for this purpose, from earlier work by Meeks and Holmes (1985). 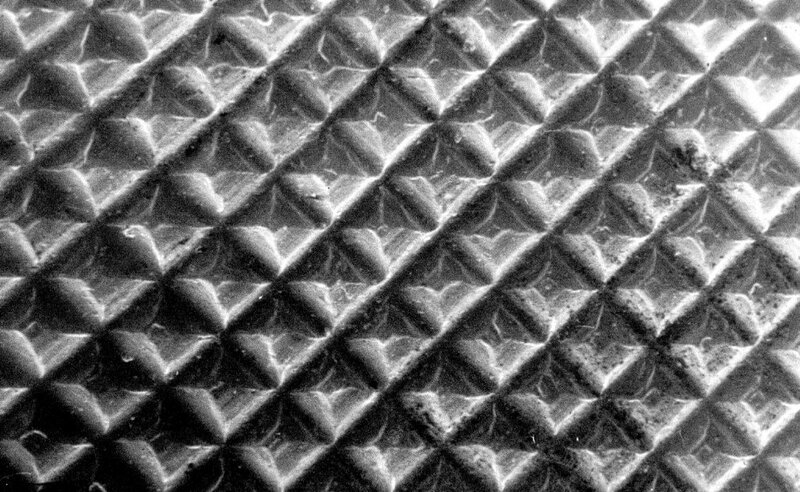 This work had resulted in model dies being made of the two types of foil pattern, 'boxed' and 'standard', which are extremely fine, complex and of extraordinary accuracy, the detail of which is only seen under magnification (See Figure 3a, 3b). These two model dies (See Figure 4a & b) were made by cutting brass with a precision that, when used to punch gold foils, reproduced the Sutton Hoo foil patterns very closely (See Figure 5). 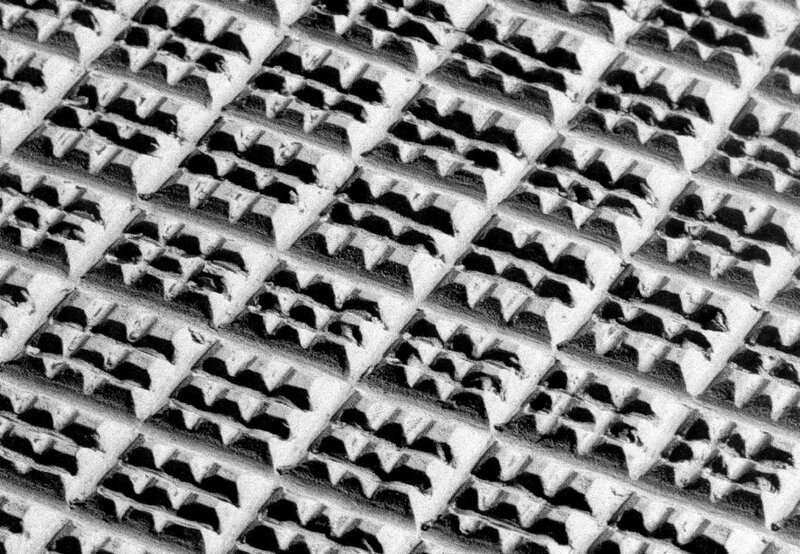 These model dies had geometric patterns of cut lines of 0.2mm line spacing that produced patterns of tiny angular pyramids (See Figure 6, 7a and 7b).The pattern of the 'standard' line spacing is so fine that it is approaching the limit of normal unaided vision. These dies were therefore ideal to be used to make wax models for lost wax casting experiments to see if the fine detail and the sharpness of the cut metal dies could be successfully reproduced by casting, using essentially early medieval materials and casting conditions. Lost wax casting is the ideal method with which to reproduce these precision dies and is a well documented method both historically (Cellini, Trans. Ashbee 1967) and in more recent contexts (Feinberg 1983, Edwards 1974, Untracht 1969, 1982). The two models of the Sutton Hoo dies are shown in Figures 4a and 4b. Initially two sets of experimental wax models were made from these dies. The first set was made by punching the dies into hard wax. This is the same technique that was used experimentally to punch gold foils onto lead backing (Meeks and Holmes 1985). The wax was a hard modeling wax that was prepared by melting (at 140°C) into small, shallow plastic boxes. It was surprising how hard the punch had to be struck using a single blow with a 1kg hammer to fully impress the die faces into the wax to take all the details. The die had no tendency to stick to the wax and lifted off cleanly. Lighter hammering produced a 'shallow' punch pattern which only took the tips of the die pattern. Nine satisfactory wax models were prepared, mostly with two stamped patterns on each wax blank. A second set of five wax models was made from brown beeswax which proved more difficult to use. After preparing beeswax blanks by melting into plastic boxes and cooling to room temperature, the wax was too soft to punch easily. With a heavy blow the die sank too far into the wax which was too soft and sticky to remove easily from the dies without distortion. Nevertheless, by gentle die punching nine more suitable wax models were satisfactorily made. Many variations of wax mixtures are published on the basis of practical experience (Untracht 1969). In all, fourteen wax models were made for the first casting experiments. Making the moulds from these wax models was a routine procedure. The local Wilhelminaoord loam-clay was used, being very clean but with an organic content. The backs of the 'potato' sized moulds were made about 2cms thick and placed on a flat surface. Wedge-shaped wax ingates were made and moulded onto the wax die models. The models were then put onto the clay mould backs, with the die impressions facing upwards. Thin straw tubes were placed touching the wax models and angled towards what would be the top of the mould to act as risers, two on each side (See Figure 8). The important next step was the investment of the wax die faces with very fine clay, which would become the mould walls with all the details of the wax pattern when the wax was melted out. In half of the models, a thin slurry of the finest clay was made and painted onto the wax die faces to ensure that all the air was excluded and the clay reached every part of the fine pattern (See Figure 8). Fine clay was then moulded directly onto this clay slip, after sufficient manipulation the ensure a very soft texture. With the other wax models the same fine clay was applied directly to the wax. The local loam-clay was again used to make the 2cm thick front of the moulds. The mould halves were carefully sealed together with clay to form a one piece mould. The moulds were allowed to dry slowly at first, at room temperature, then at radiator temperature overnight as they were needed for casting the next day. Slow drying was essential to avoid shrinkage cracks from forming. The next morning the moulds were apparently dry and ready for preheating in a hearth. For the two casting sessions the moulds were inverted and first heated gently at the side of the preheating hearth for about two hours and then further into the hearth at higher temperature for several hours, although they were probably not fully fired. 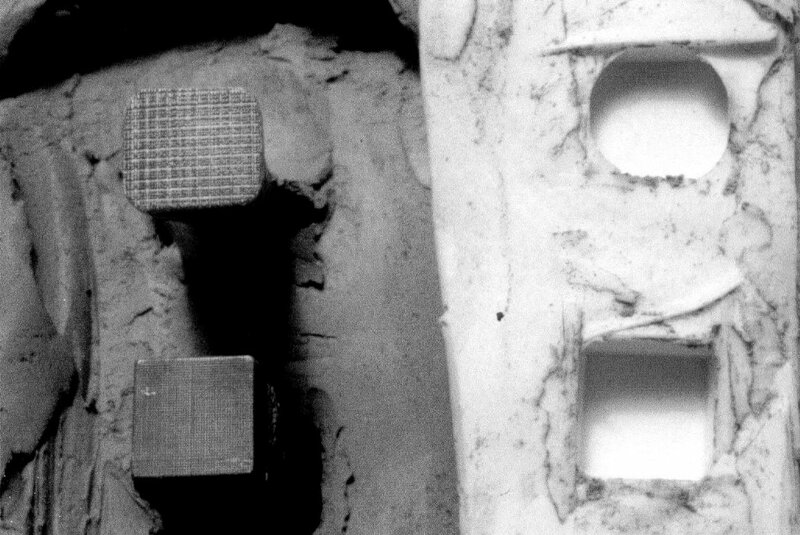 This allowed the clay to fully dry and the wax to melt out completely, and further heating baked and hardened the mould (Freinberg 1983, Edwards 1974, Maryon 1971, Untracht 1969). Drying was very important to prevent blow-back of the molten metal from a damp mould during casting. Chemically bound water in clay releases at between 400°-500°C so the mould temperature must be heated to these temperatures before molten bronze is poured in. For the same reason the wax needed to be fully melted out and any residues of wax, carbon deposits and organic matter from the mould burnt away during burn-out at high temperature (Untracht 1969). Heating to 800°C will fire the clay to ceramic. One difficulty was to prevent ash and charcoal from entering the open ingate once the wax had been melted out. For precision casting this would be most important as any defect caused by ash would significantly affect the quality of the finished casting. Some moulds had to have charcoal removed and ash blown clear. Melting the bronze for casting was carried out in a large twin-bellow furnace in the casting house. The metal composition for the casting was 12% tin, 3% lead and 85% copper (as an estimate of the composition the Tjitsma die, which was too corroded for accurate analysis). The metal was heated for some two hours before it was suitable for casting. At this point the whole inside of the furnace was at a uniform yellow heat with the crucible set centrally. The molten metal was stirred with a green stick, as recommended historically (Hodges 1976), to ensure reducing conditions. The metal appeared very fluid when cast and the temperature was estimated to be around 1100°C. The metal must not kept molten too long before pouring and must be neither too hot nor too cool for pouring, about 100°C above the alloy melting point is about right (Smith 1978). The experience of the bronze caster was essential in determining when the bronze was ready for casting. It is a skill learned from extensive practice and involves a combination of assessing the colour of the melt, its fluidity and subtle indicators that are uniquely recognized by the experienced caster. It is true to say that a bronze caster waits for no man - when the metal had reached the critical point for casting there was a sudden flurry of activity. The crucible was quickly removed from the furnace, to prevent significant cooling, and the bronze poured relatively quickly into the moulds which were standing vertically in the sand of the preheating hearth. The moulds were left to cool for several minutes before breaking open to extract the castings. During casting, one of the moulds was found not to have had the wax fully removed; as the molten metal was poured in the residues of wax burnt off instantly and the metal was blown out. In this case, the cast metal formed a plug in the ingate, but this proved valuable because we were able to open the mould and examine it to look at the detail of the inner mould wall (See Figure 9). 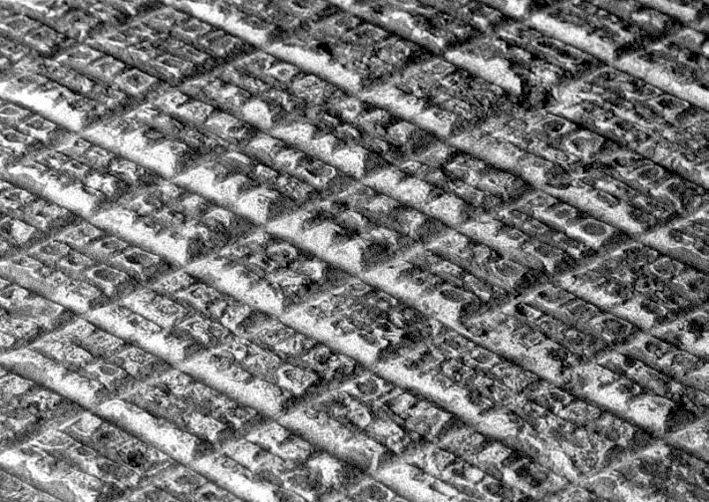 This mould was examined directly in the SEM and showed that it had taken all the details of the wax model extremely well, the pyramids (of the original die) being well formed (See Figure 10). Even a miscut line on the original die at 0.1mm spacing was clearly reproduced in this mould. Similarly, the imprint of the ‘boxed’ pattern shows all of the basic geometric pattern (See Figure 11). However, a limiting factor for the resolution of the mould surface appears to be the actual texture of the fine clay slip. The clay particle size of the slip was a few microns, and is thought to be about as fine as one can achieve in practice. 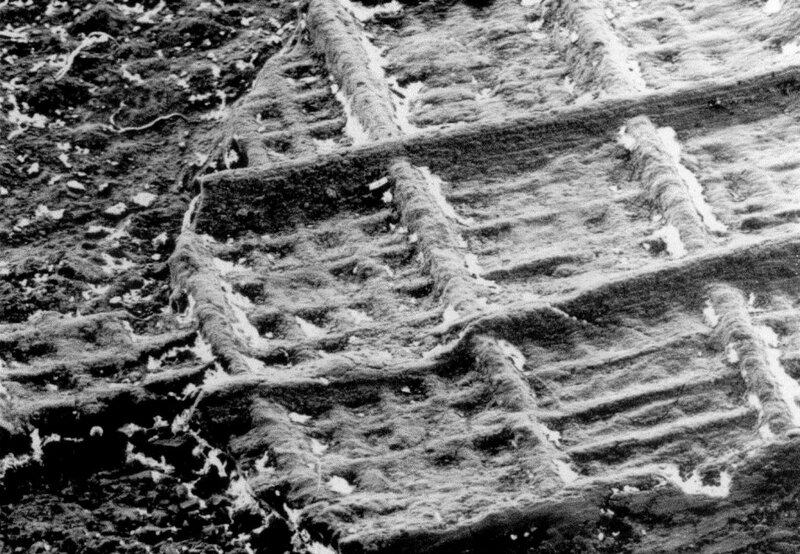 The clay particle texture on the pattern in the stamped regions of the mould was the same as the texture on the un-stamped original wax surface (See Figure 10 and 11). The patterns were well formed so this was a successful result as far as modeling and mould making was concerned, and showed that the investment procedure was satisfactory. Although the investment clay particles were very fine compared to the size of the pattern, they added a small but significant texture to the mould surface. 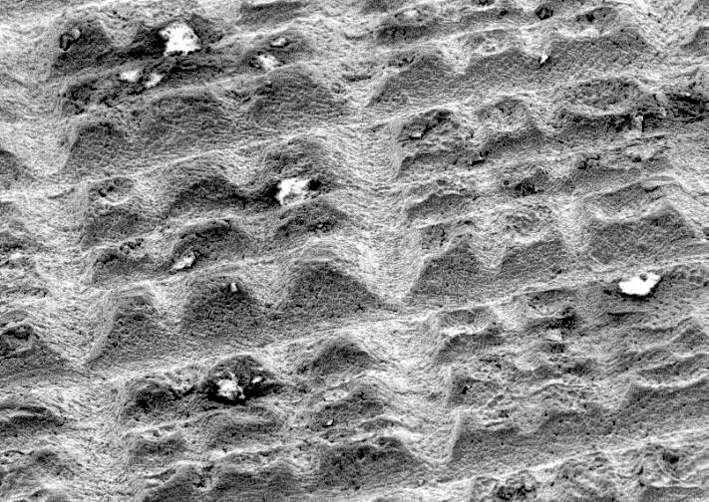 It would be interesting to see whether this clay texture would be observable on the castings. Examination of the cast dies initially showed that only some of the original die details had been recorded in the metal and that in many cases the details were not clear or sharp (See Table 1a). It appeared that the metal had reached the mould face and had taken the general impression of the die (eg. no.3), but had not gone fully into the pattern and this prevented the finest details from being cast into the metal (See Figure 12). This raised the question of why? The problem was only partly due to the fine dendritic surface, but even these had not taken the pyramid pattern of the mould. The metal does not seem to have been forced into the mould face. The problem may have been due to surface tension, the metal pulling away from the clay mould as it touched, and made worse by shrinkage on cooling. Perhaps this was affected by the casting temperature of the metal or the mould may not have been hot enough, causing the metal to cool too quickly as it touched the mould walls. It was probably a combination of these factors that affect the nucleation and growth of dendrites (Hanson & Pell-Walpole 1951, Rollason 1973). These casting conditions may well have been satisfactory for many types of larger object that do not require such definition on the surface and where fine surface dendrites do not matter, but the conditions were not rigorous enough for the finest casting. There seemed to be no differences in results from moulds made from the two types of wax. Because the finest details of the moulds were not picked up in these castings, a second series of experiments was later conducted under more controlled conditions. The second set of die casting experiments was carried out by Anders Söderberg under more controlled workshop conditions, in Sweden, to try to achieve improved highly detailed castings than were obtained in the field, and to record conditions under which these were obtained. His expertise is in fine castings. 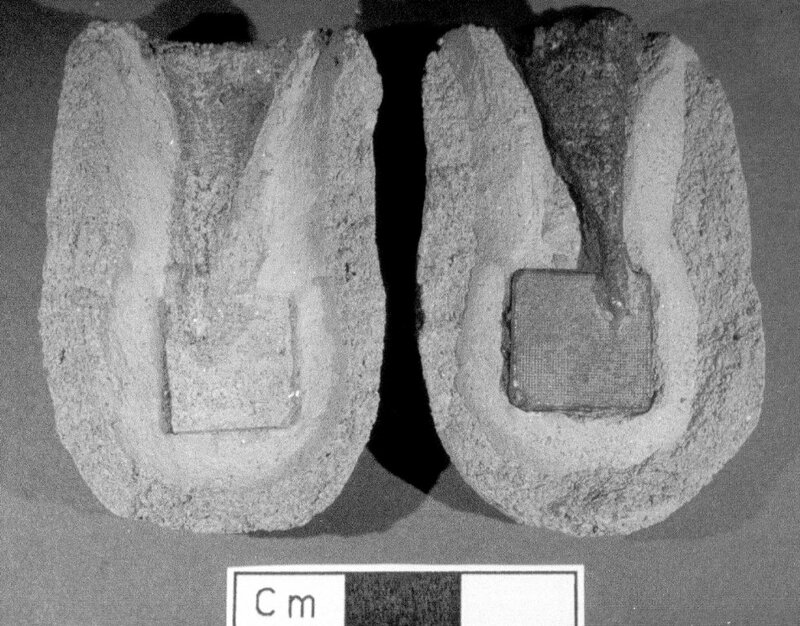 In this case, silicone rubber moulds were made of both the Sutton Hoo model dies (See Figure 13) and wax impressions were taken from these for investment and casting. Thus the final cast models would be three generations away from the original cut model Sutton Hoo dies, but under the microscope the silicone copies showed no apparent loss of detail in this process. Five lost-wax castings were made from these wax models using tempered clay as moulding material. The firing of the moulds and melting of the bronze were made in an electric furnace allowing more accurate control of the temperature than was possible in an open hearth. The moulds were made from common Swedish glacial clay of earthenware quality, tempered with sand, a chamotte (grog) made from ground moulds, and fine sawdust (in the proportions of approximately 40 % of clay, 58 % of sand and chamotte, 2 % dry weight of sawdust). For an inner layer, next to the wax models, the clay was mixed with approx. 50 % of silt. 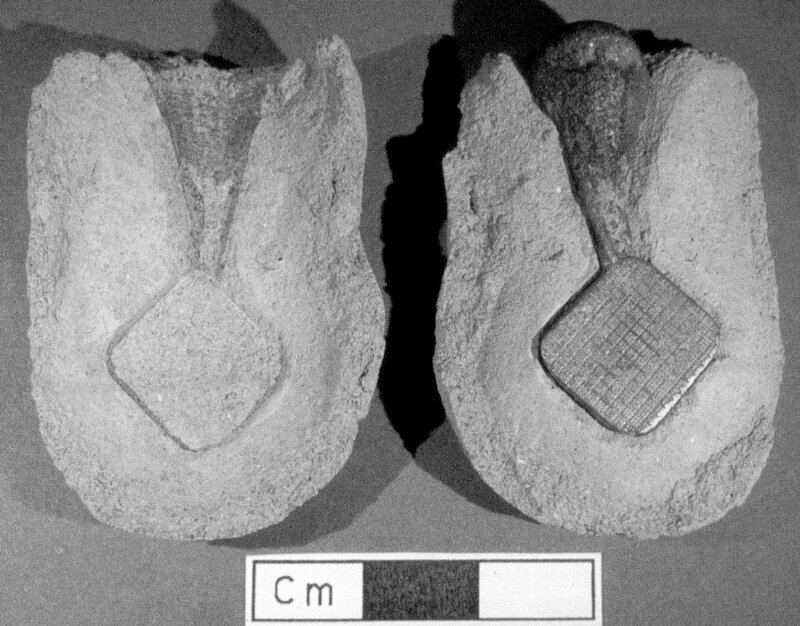 These were made as two-piece lost-wax moulds, commonly used in Scandinavian Iron Age and Early Middle Age; as interpreted by Danish archaeometallurgist Bjarne Lønborg (Lønborg 1986,79ff). This allowed the used moulds to be opened more easily after casting, without destroying them so they could be examined. The moulds were made by putting small lumps of clay on a water-absorbing ceramic plate, after which the fine silt-slip clay was put on top in thin layers. The wax models were then pressed into the material, with their upper (patterned) sides up. After short drying, isolating layers of soft soap made from wooden ash were applied to the wax model surfaces. After drying the soap layers, layers of clay/silt-slip were put on the pattern-surfaces. The clay upper mould halves were applied over the wax models and sealed to the lower mould halves. After drying the moulds for two days, the wax was melted away over an open flame, then the moulds were fired in an electric furnace at 800o C for 60 minutes, at which temperature all organic matter was burned out and the clay became a fired ceramic. A thorough firing under oxidizing conditions is essential for making a good casting (the clay being oxidized red throughout), as insufficientely fired clay develops gases when pouring the molten metal, badly affecting the casting. Many Scandinavian moulds have been found (Jensen 1991, Fuglesang 1992, Brinch Madsen 1982 & 1984), still with grey areas on the mould surface; moulds that probably would not have created perfect castings. There are also many examples of moulds with black inner layers. 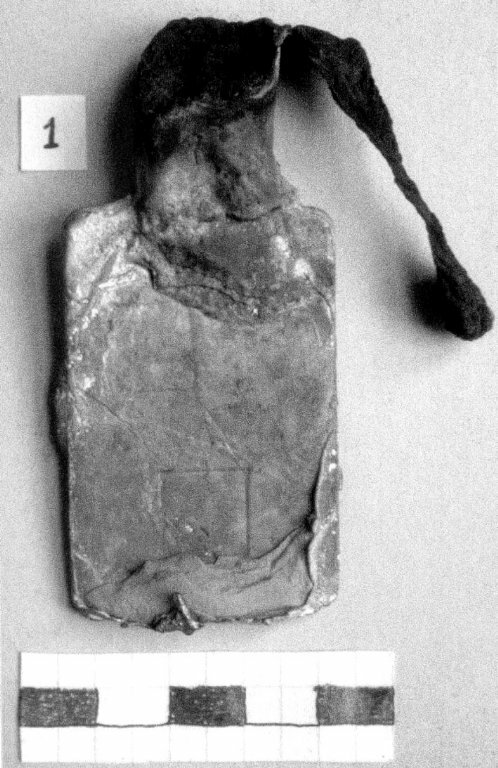 These were probably first fired in an oxidizing environment throughout; then some oil was dripped into the hot cavity and burnt to form a carbonised layer on the mould surface thereby increasing the running of the metal when casting and creating an excellent, very thin, release layer preventing the metal from sticking to the clay. For the experimental die-castings the moulds were not carbonised in this way. 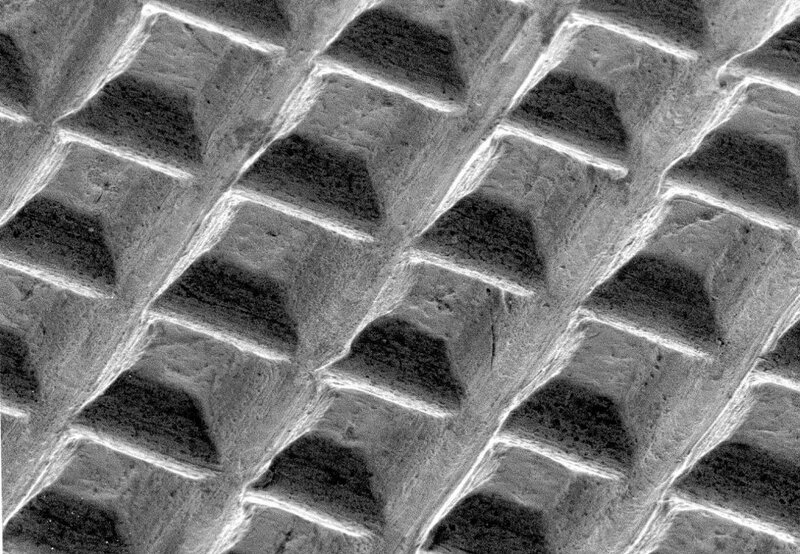 As carbon and metal seem to repel each other slightly, this would not be the best method for casting extremely fine patterns that was required. Moulds retaining a black, carbonised surface produce gas on contact with molten metal that can affect the cast surface, and the carbon would tend to block the pores in the clay and prevent gas escaping (Untracht 1969, 370). Without the carbonised release layer we have the problem of metal sticking to the clay. The castings were pickled in vinegar afterwards in order to remove clay residues stuck to the surfaces. The advantage of using only fully oxidised moulds with no further treatment is that it does provide excellent conditions for casting objects with finely patterned surfaces. The casting alloy used was a tin-bronze containing 12% tin (Swedish standard SS5465). The metal pouring temperature was 1100°C in all five castings. The mould temperatures were; in casting number one 540°C; in casting two 530°C; in casting three 520o C; in casting four 600°C; and in casting five 620°C. The temperatures were all measured in the furnaces. 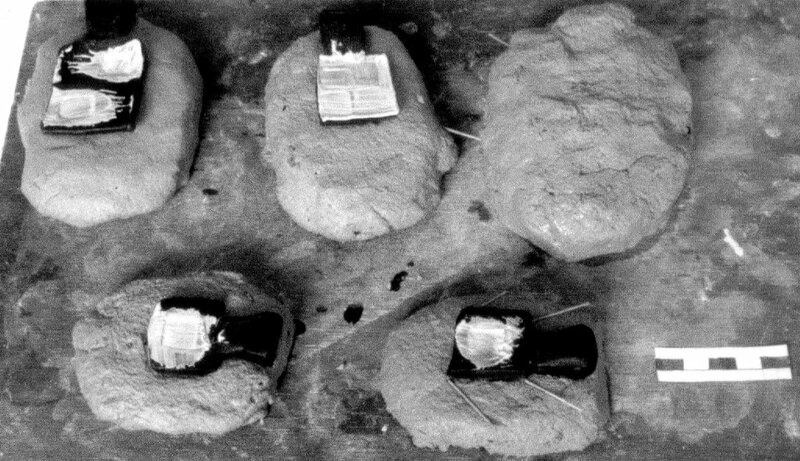 After casting, the moulds were allowed to cool down and carefully opened (See Figure 14 and 15). The cast objects were pickled in strong vinegar for 60 minutes to soften the adhering clay residues, followed by soft brushing. The patterned surfaces of the moulds have been lost due to the metal sticking to the moulds (apart from a small area of 'boxed' pattern on mould number two). On these cast dies, there still was some clay stuck in the depth of the fine lines. The surfaces were brushed with a soft toothbrush in order not to polish them too hard. 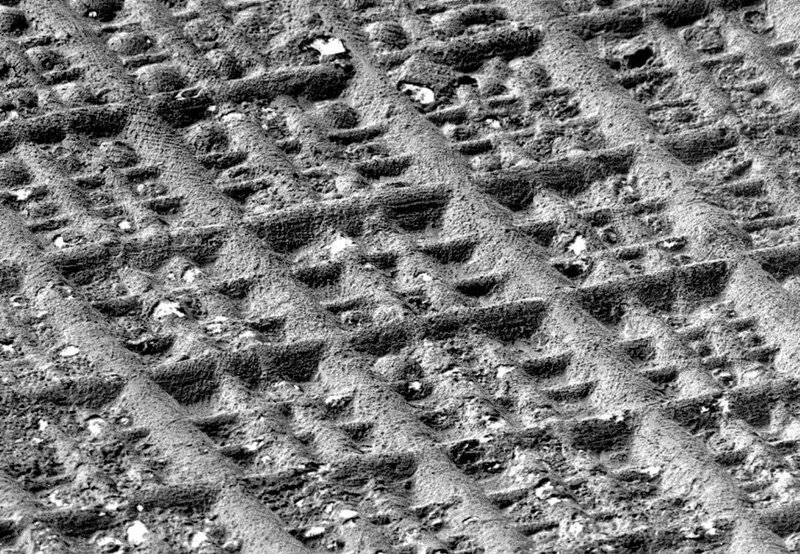 Despite this, a slight abrasion of the patterns may have been unintentionally made, because of the released clay and sand from the moulding material itself. Results of the second casting experiments. A brief check of the cast surfaces with a magnifying lens showed a few casting faults in the patterns. The greatest fault being depressions in the little pyramids between the lines. This occured when making the wax models from the silicone mould. Small bubbles of air were trapped on the pyramid tips when the molten wax was poured onto the silicone mould. There are also a few larger holes in the surfaces of castings four and five, also caused by air in the wax. On the surface of casting five is a circular shape caused from pouring the wax in two steps - a short pause was unintentionally made when pouring. As these faults are all matters of difficulties in casting the wax models, the metal castings themselves must be said some having turned out well as they seem to show, in a very convincing way, the excellent casting properties of early medieval style clay moulds. Of the five castings, three were of the ‘boxed’ pattern and two of the ’standard’ pattern. Under the binocular microscope all of them showed the good general detail of the die patterns, but two appeared to have better fine detail; no. A3 ‘boxed’ die and no. A5 ‘standard’ die (See Table 1b). 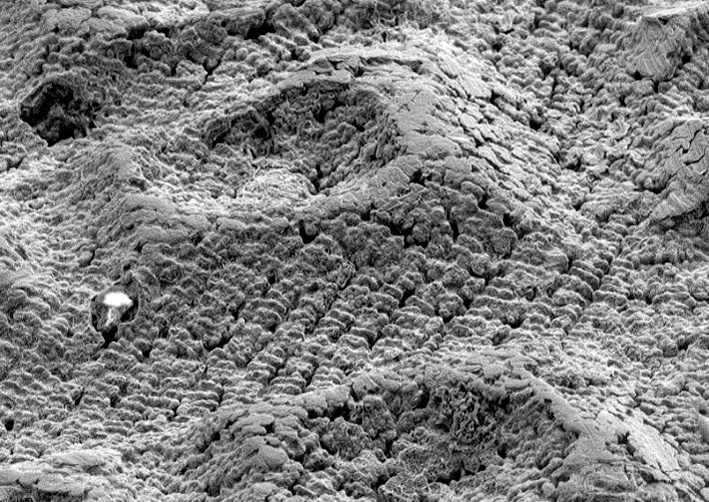 These two were studied in some detail both optically and by scanning electron microscopy (SEM). 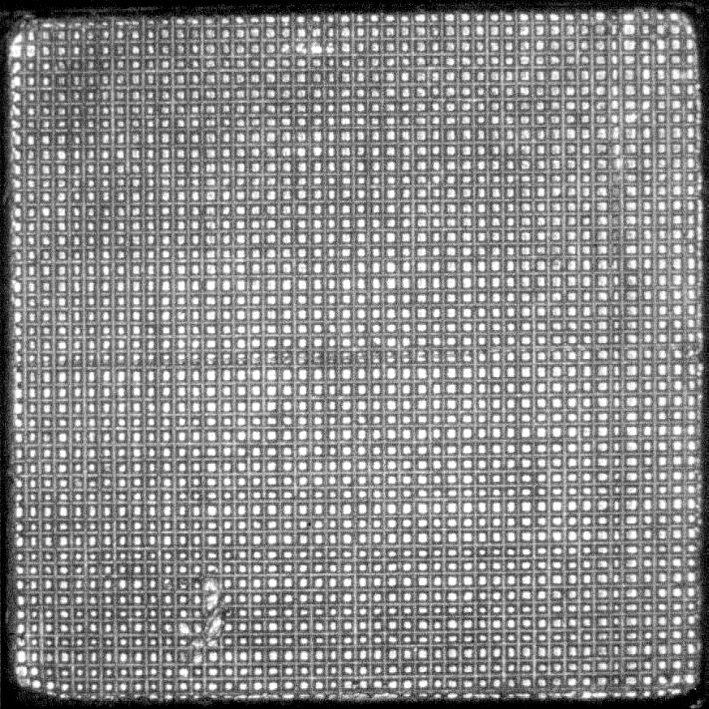 At low magnification (See Figure 16, x20) the casting seems to have taken the whole boxed pattern well. Both the wider and finer spaced grooves are well formed in both their cross-section shape and in the angularity of the pyramids. The casting is a good representation of the original cut die. Only the depressions on the points of the pyramids from trapped air during moulding (noted above) spoil the casting. There seems to have been no problem in casting the main features of the pattern with these fine dimensions. Even the slightly irregular shapes of the original cut die pyramids are seen. 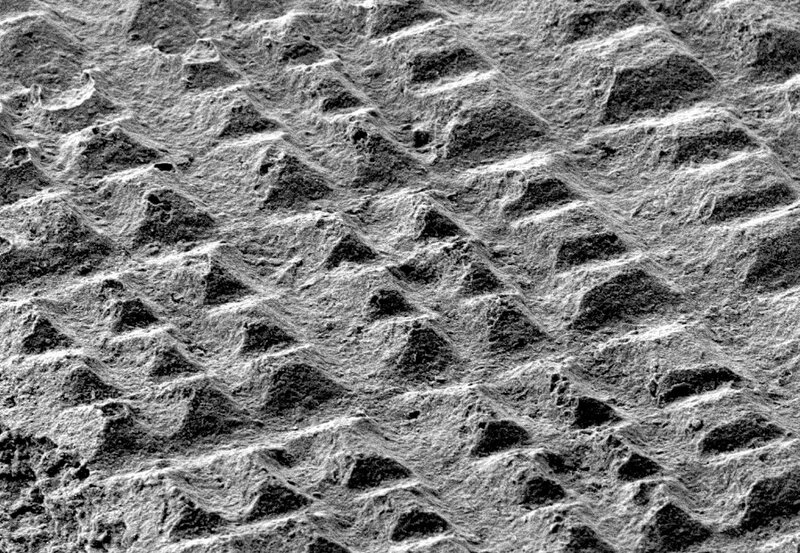 However at higher magnification (See Figure 17, x50), the dendritic surface of the casting is clearly visible, although where the lines intersect, the corners of the pyramids are still quite angular. The texture of the dendrites is much more coarse than that of the clay particles of the mould, and in some areas is particularly more coarse (See Figure 18, x200). The dendritic texture is clearly the limiting factor for the resolution of the casting, the dendrites being much larger than the clay particle size of the mould. By comparison, the original cut die is much sharper (See Figure 6). The general comments applied to the 'boxed' casting also apply to this 'standard' pattern casting. In fact this casting is perhaps more impressive as the line separation is only 0.2mm and the full area of the original die has been successfully cast with all of the pattern of lines showing. 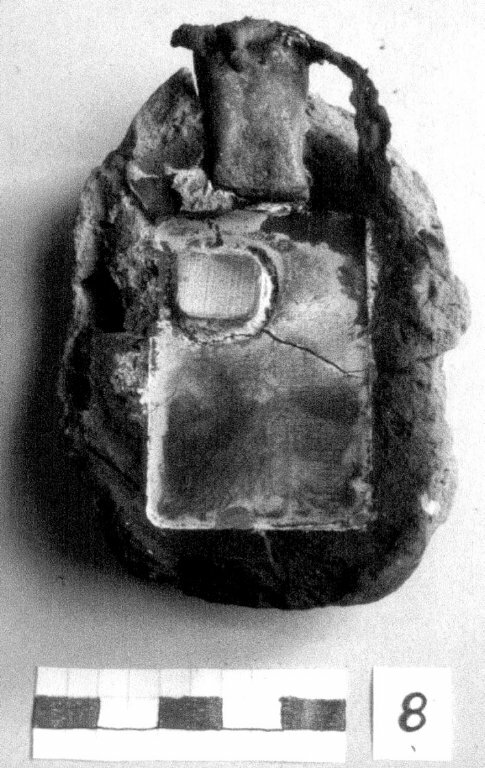 The fine clay mould face must have accurately reproduced the original cross-hatched die pattern and had resisted erosion from the molten metal despite the tiny size of the pyramids whose tops are only about 0.12mm square, but there are some defects in the casting where pyramids have not fully formed (See Figure 19). 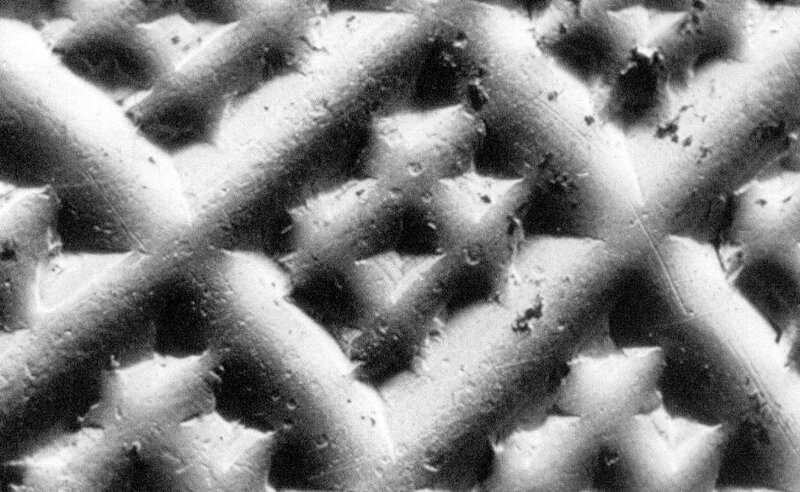 At high magnification (See Figure 20, x180) the accuracy and angularity of the cast grooves and pyramids are seen, but, as with the 'boxed' casting, the dendritic surface is also clearly visible, and there is no evidence of any clay particle texture from the mould. The interdendritic porosity on the surface shows that as the dendrites were formed by nucleation and growth, shrinkage of the remaining molten metal occurred and it was drawn away from the mould surface into the core during solidification. The long freezing range of bronze promotes these effects. Again, the dendrites are the limiting factor for the resolution of the cast surface and give it a significant texture. The interdendritic porosity is about 0.01-0.015mm between dendrite arms which is about 5-8% of the width of the line pattern spacing of 0.2mm. By comparison the original cut die is much sharper (See Figure 7a and 7b). It may seem obvious, but if metal did not shrink on cooling, then the interdendritic surface texture and porosity would not occur and the casting would be as good as the fine clay mould surface. This is one reason why centrifugal casting and pressure casting were developed in the 20th century (Edwards 1974, Untracht 1969) to overcome these limitations by forcing the molten metal against the mould wall, thus counteracting the effects of shrinkage, surface tension and gas porosity. Another modern development in casting is to add inoculants or grain refining agents to initiate heterogeneous nucleation to promote very fine crystallisation of the solidifying metal (Rollason 1977, Hanson & Pell-Wallpole 195l). If these experimental dies were used in their as-cast state to stamp gold foils, then the foils would reproduce the dendritic surface texture, because gold is very soft and the force of punching is so great. 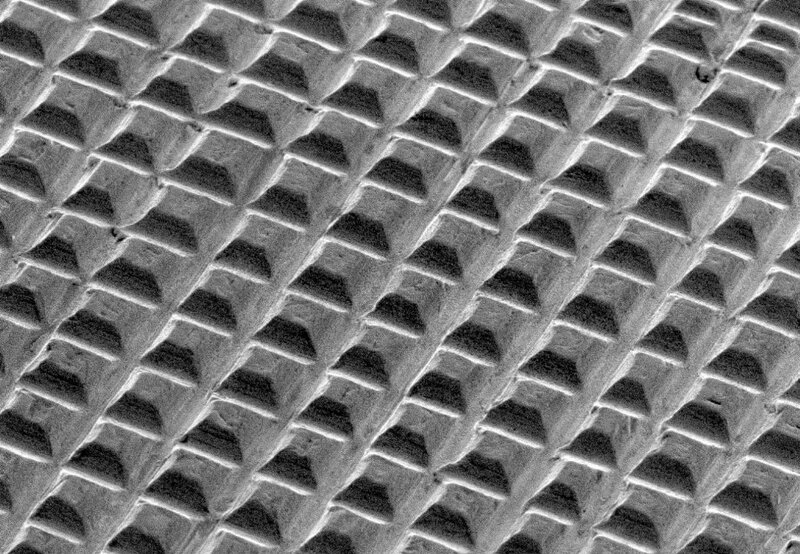 This texture would be clearly seen under high magnification. None have been seen on the Sutton Hoo gold foils indicating that those dies were cut, not cast. 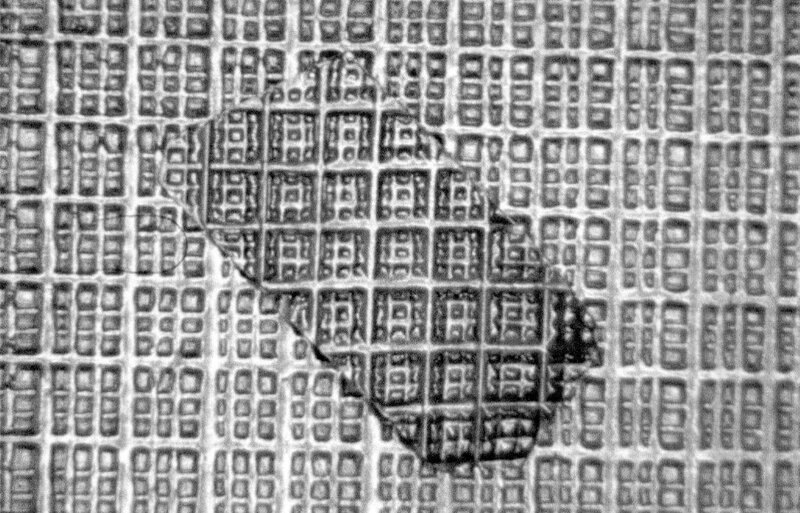 To simmulate the effect of a punched, dendritic foil texture, Figure 21 shows an image of the 'boxed' die in which the SEM image is rotated through 180°C to give an optical illusion of what a positive foil surface would look like using the cast die as a punch. 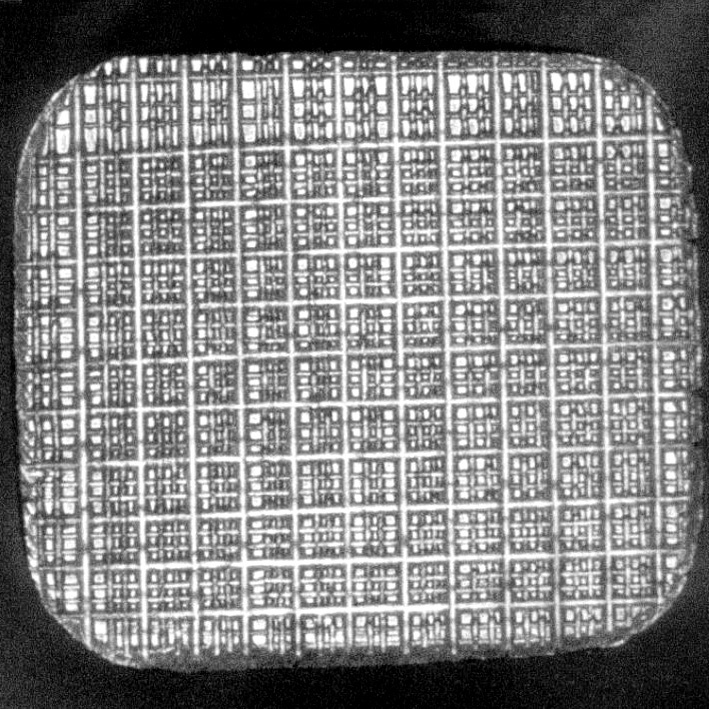 This can be compared to the image of the Tjitsma die (See Figure 1), but it should be noted that the original Tjitsma die has a corroded surface and any evidence of surface dendrites that may have been present are lost. However, the comparison does emphasise the design similarities of the 'boxed' patterns between Tjitsma die and the Sutton Hoo model die, and hence the original Sutton Hoo gold foils..
With negative cast dies like these experimental ones, it would be possible to use extremely fine files to clean up the dendritic surface somewhat, but whether the cast pattern could be significantly improved depends how far into the metal the porosity extends. Excessive filing would significantly alter the line widths and depths, and give the pyramids sharper points, and might possibly spoil the die. By comparison, with the Tjitsma die it would not have been possible to do any mechanical finishing work on the positive cast surface without causing damage, the details of the pattern are too fine and complex. The first set of experiments successfully achieved high quality, finely detailed lost wax moulds using early medieval techniques and materials. Many of the moulds survived casting with the patterns in tact, but the detail transferred to the metal during casting was less successful. This was probably due to the difficulties in accurately estimating and controlling the temperatures of the stages of drying, burning out and preheating the moulds, and then of the metal pouring temperature, and the subsequent cooling rate. 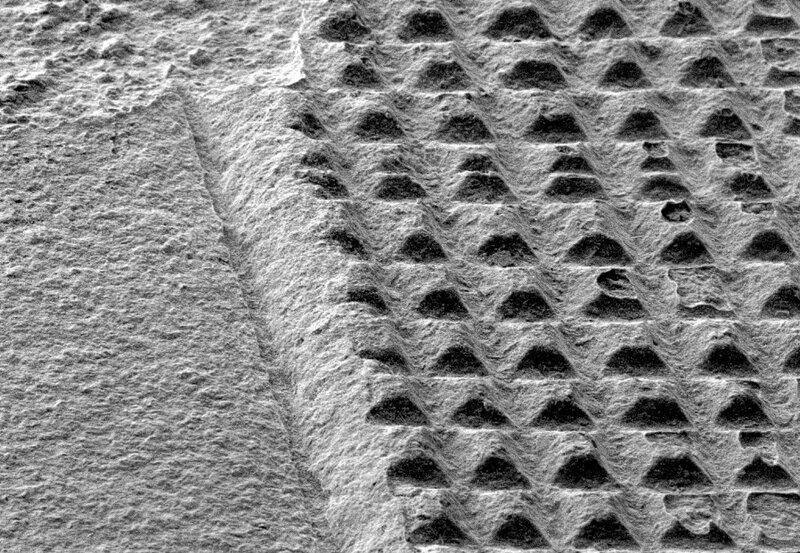 The second set of casting experiments with better control of conditions was successful in reproducing very fine geometric patterns of the original model dies, with pyramids down to 0.2mm line spacing. It is clear, particularly when casting under early metalsmithing conditions, that at each stage of the process the very best practices must be undertaken to ensure a good final product. The original wax moulding has to be accurate. Investment in the finest clay slip has to preceed building up the clay mould. Drying the mould must be done slowly at first to prevent cracking during initial drying. The best castings came from the more controlled conditions in which the moulds were heated well into red heat (c. 800°C) for an hour under oxidising conditions to melt and then burn out all of the wax and any carbonised residues. This will also partly fire the clay into ceramic to consolidate and strengthen the fine pattern on the face of the mould to prevent erosion by the molten metal during casting. The moulds also need to be at high temperature just before casting (520-620°C) to prevent over- cooling the metal on contact with the mould surface, therefore giving the metal time to fully fill the fine mould pattern before begining to solidify. With the experimental castings there seemed to be a little improvement in the cast quality at the highest mould temperature used (620°C). The metal casting temperature of 1100°C, about 100°C above the melting point of 12% tin bronze, appears to be satisfactory. With the well-fired mould, and without a carbonised separating layer, there is a tendency for the metal to stick to the mould, but this can be cleaned off, albeit with some difficulty. But this gives a better registration of the pattern than a carbonised mould. Even with all these careful steps, the limiting factor for high definition casting bronze appears to be the dendritic surface that develops due to shrinkage of the cooling molten metal as the dendrites form. This leaves a very fine dendritic texture and interdendritic porosity in the surface, and this fine texture is relatively much more coarse than the even finer clay particle texture of the mould. Surface tension of the molten metal also has some part to play in limiting the sharpness of the cast details. By comparison with the original experimental cut dies, the microscopic features are not as sharp, but the overall patterns have been successfully cast. Practice of good casting procedures would no doubt improve the castings, but ultimately the dendritic structure would appear to be the limiting factor for surface detail and resolution. With more recent practices of, for example centrifugal casting or grain refinement, the limiting factor would then be the texture of the fine clay slip surface of the mould. Ogden (1982) suggests that spinning the mould on the end of a cord, with its molten metal, could have been used as primitive centrifugal casting and is still in use in various parts of the world. While some of our castings took less of the fine detail of the moulds, the casting conditions would have been quite adequate for larger cast objects that have little or no fine surface detail to reproduce. High definition casting, by comparison, requires much stricter control of all aspects of the whole procedure of moulding and casting. Studying the successful experimental casting of the cast 'boxed' die under magnification (See Figure 21) and comparing it with the detailed pattern of the Tjitsma die (See Figure 1) emphasises the superb quality of the original Tjitsma die casting. Also, the high magnification images illustrate the remarkable similarities between the 'boxed' pattern of the Tjitsma die and the 'boxed' patterns of the gold foils from Sutton Hoo (See Figure 2, 3 and 5), from far across the North sea, in the 6-7th centuries AD. The brown wax was softer and stickier than the green wax. The green wax melted at about 140°C. The moulds were not made of very clean clay, but quite organic clay. Also they were not fired before casting, just dried and heated up in a small charcoal hearth. Small pieces of thin straw were used for channels from the wax models for the outlet of air. Since some of the castings have air of gas bubbles, the straw does not seem to work too well in some cases. Boxed pattern. Mould heated to 540°C. No detail left on mould. Casting - overall pattern ok, but detail variable. Fine dendrites on back. Boxed pattern. Mould heated to 530°C. Some clear pattern marks left in mould. Casting - overall pattern ok, but detail variable. Fine dendrites on back. Standard pattern. Mould heated to 600°C. No details left in mould. Casting - excellent pattern of tiny squares, (bubble hollows on pyramids from silicone mould). One casting pore on die. Standard patern. Mould heated to 620°C. No details left in mould. Casting - excellent pattern of tiny squares over all cast surface. See SEM results. ARRHENIUS, B., Merovingian Garnet Jewellery, Emergence and Social Implications, , Göteborg, 1985. ASHBEE, C. R., The treatises of Benvenuto Cellini on Goldsmithing and Architecture, , New York, Dover Publications Inc., 1967. BRINCH-MADSEN, H., "Viking Age - metalcasting technique", PACT, vol. 7, issue 2, pp. 497-500, 1982. BRINCH-MADSEN, H., "Metal casting. Techniques, production and workshop", Ribe Excavations 1970-76, vol. 2, Esbjerg, pp. 15-93, 1984. BRUCE-MITFORD, R., The Sutton Hoo Ship-Burial, , vol. 2, London, The British Museum, 1978. FUGLESANG, S H., "Mass Production in the Viking Age", From Viking to Crusader: The Scandinavians and Europe 800-1200, Uddevalla, pp. 198-199, 1992. JENSEN, S., "The Vikings of Ribe", Den antikvariske Samling, pp. 31-35, 1991. LØNBORG, B., "Bronzestøbning i dansk jernalder", Kuml - Årsborg for Jysk Arkæologisk Selskab, vol. 1988-89, Århus, Jysk Arkæologisk Selskab, pp. 77-94, 1989. MARYON, H., Metalwork and Enamelling: a practical treatise on gold and silversmiths’ work and their allied crafts, , New York, Dover Publications Inc., 1971. OGDEN, J., Jewellery of the ancient world, , London, Trefoil Books, 1982. ROLLASON, E. C., Metallurgy for Engineers, , London, Edward Arnold Ltd., 1973. SMITH, E. A., Working in Precious Metals, , London, N.A.G. Press Ltd, 1978. TULP, C., and N. MEEKS, "The Tjitsma (Wijnaldum) die: a 7th century tool for making a cross- hatched pattern on gold foil, or a master template? ", Historical Metallurgy, vol. 34, issue part 1, London, the Historical Metallurgy Society, pp. 13-24, 2001. UNTRACHT, O., Metal Techniques for Craftsmen, a basic Manual on the methods of Forming and Decorating Metals, , London, Robert Hale & Company, 1969. UNTRACHT, O., Jewellery Concepts and Technology, , London, Robert Hale & Company, 1982.